Well I found at last the bread pudding my mum use too make lost her recipe,and my old nan,but she used fresh suet used too grate it,she was a brill cook and so was all her girls,she had 11 children,when she made a stew,her pot was like a witches,but thanks again. You’re welcome. Nothing better than old recipes! My mum would make this years ago when I was at school. She called it NAFFI Wedding Cake and when it was cold she would spread jam over the top and then sprinkle with coconut. She was in the NAFFI during the war and ended up as a NAFFI manageress at a British Garrison in Germany after the war. Apparently quite a few soldiers married local girls and with food shortages and rationing this was made as the wedding cake hence it’s nickname. Tastes so good but I think she also put treacle in it as it was much browner. Just the thing when I got home from school after rugby practice! The bread never had all the preservatives it has today, so the bread really had to be eaten the day you bought it 😊. 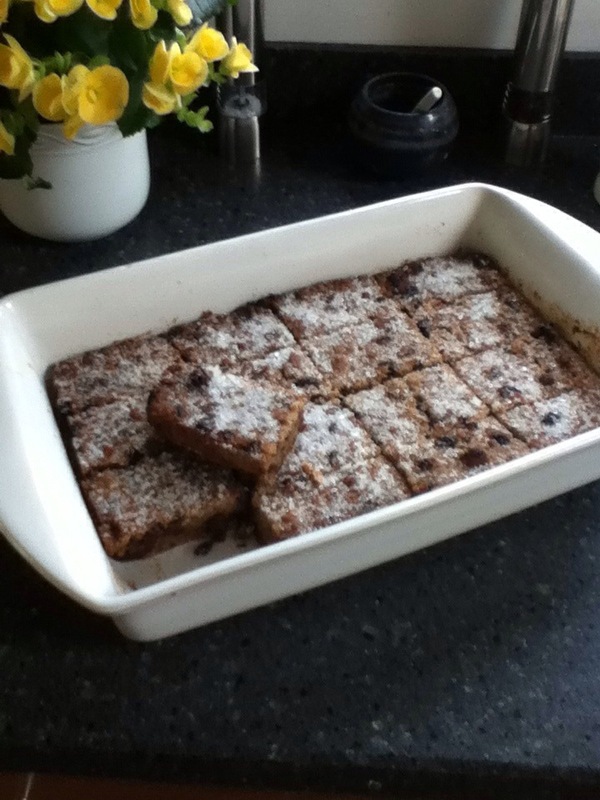 My mum used to make loads of bread pudding, it was a good tummy filler for my brothers and me. This is almost the exact same receipe that my late mother-in-law passed down to me but she always added one egg to the mixture. Along with the mixed spice I always add a good spin of cinnamon too! Used to make this for my children..I grew up with it too. Nan made it every weekend. It is an old staple! A bread pudding would not be a bread pudding without beef suet. My grandmother’s recipe called for nutmeg instead of mixed spice. Just made this using a mix of wholemeal and white bread, raisins, currants and raisins and butter instead of suet. Delicious 😋. Thank you so much for the recipe. Hi guys , do you really need the suet ? Don’t recall this going in mum’s bread pudding but I wasn’t always around to watch out scrumping !!!!! No. You can use whichever fat you like, butter, marge, vegetable shortening etc. Just the job. I ‘ve been trying to find the recipe used by my gran and mum probably pre war. My father’s father loved it when in the RAF at West Malling. Thanks for publishing I distinctly remember soaking the bread I also remember soaking the mixed fruit. Off to give it a try. I am a cheapskate !!! Really pleased it worked for you! That’s the way my mum made it only one difference she used stoke margarine not sure. It’s a cheap tasty pudding. My Grandmother made wonderful bread pudding when I was a child (many, many years ago). I have tried to find a recipe but they all seem to use butter & cream not suet. Have just found this so I’m off to the kitchen to try it. Let us know how you get on?! At last a proper bread pudding like my mother made without eggs and milk, just needed reminding, i added a little cinnamon as well delish!! We are so pleased you liked it! Thanks for the feedback! Really hope it works fir you! Let us know how you get on? Thanks. I was looking for a good bread pudding recipe and this is amazing and cheap! Followed your instructions to the letter (also used sultanas as not a fan of dried mixed fruit) and worked perfectly. Made a big glass roasting dish full and everyone loved it. Anyone looking for one like Tesco used to make years ago will love this. Will definitely be a regular in our house ☺. Wasted a load of ingredients thanks to this!!!!!! Did you soak the bread long enough, I don’t even squeeze out the liquid as the bread and fruit mix usually soak it all up. Also I find slow cooking is the best usually 140 degrees for 2 hours until crunchy on top. Please try it again it will be worth it and please no eggs !